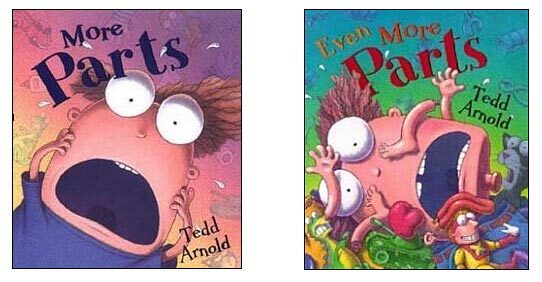 These fun books are the much anticipated sequels to Ted Arnold's hilarious and very popular book Parts. Whereas the first book addressed common childhood body-related fears, these titles present a young boy who takes idioms about the human body literally---to comic effect. Phrases like "give him a hand" and "jump out of his skin" have the boy petrified! These books are classics! In our experience, children get a big kick out of this book and want it read aloud again and again. Just be careful, you might laugh your head off! :) We haven't run into a child who found the books frightening, as most children do understand the joke, but just in case, you may want to discuss what idioms are before reading the book. If you are teaching about idioms, the funny literal translation of idioms in these book will provide a great place to start. Your students will be engaged and entertained, and ready to jump into the unit and learn even more about funny idioms! And, since Even More Parts focuses on common back-to-school fears, this could be a fun book to read in the upper grades during the first week of school. The illustrations and idioms inside these books are fantastic! Ted Arnold is a master children's book illustrator! Below is a sample spread from inside Even More Parts. 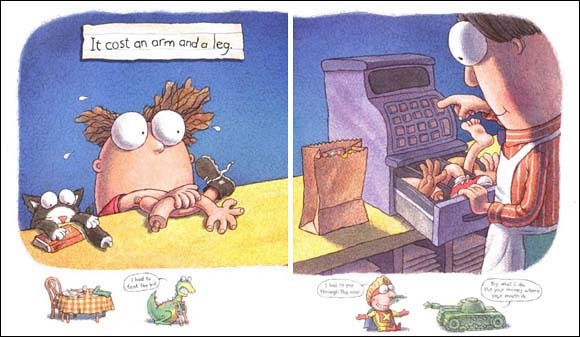 Clearly, the common idiom "It cost an arm and a leg" is what is being depicted in this spread. Even adults will get a chuckle as the realize how odd many of the idioms we say on a regular basis and don't give much though to really are.